I REMEMBER HEARING THE SOUND of my motorcycle slamming against the concrete even over the din of the waterfall. The shot of pain in my knee was immediate but the crack in my ribs didn’t announce its presence until I stood and began to hoist my bike back onto its wheels. As I lay down to a sleepless night, in a damp tent on a thin pad, I’d like to say I had a moment of clarity that changed my life, but that wouldn’t be true. The road had been kind to me all that day as it wound itself in sensuous curves around the sunny flanks of the Alps. Even the precipitous drops guarded by a thin shoulder and faded line of paint served only to heighten my senses and elevate my experience. I lost myself in its beauty, then I lost my grip on the road, then a couple of bike parts, and lastly my ability to take a deep breath. I had been learning lessons from the road for the better part of a year when I crashed my bike in that tunnel sweeping behind a waterfall, somewhere lost in the Swiss Alps. I couldn’t get you back there today if my life depended on it. I don’t have any photos of it, didn’t review it on yelp, and honestly, this is the first time I’ve ever written about it. Many of my travel memories are this way; floating in the back of my mind, waiting to find some other story to catch and sprout from. Travel is an amazing teacher, but I didn’t -- and still don’t -- take very detailed notes. I didn’t know travel was going to show me quite so much. I don’t come from an adventurous place, at least not in the traditional sense. Lost in the middle of a large extended family, good Midwest stock, kind and well planted, I was not taught to travel. It just isn’t part of the canon. But, adventure called and as soon as I finished school, paid my debts, and amassed a small amount I struck out into the unknown. What I found in travel was what I expected, and more. There were a million unique, wonder-packed places to see and feel, to soak up and hold in awe. There were people too, travelers and locals alike, a million different smiles and points of view. What I didn’t see coming is what I learned about myself. 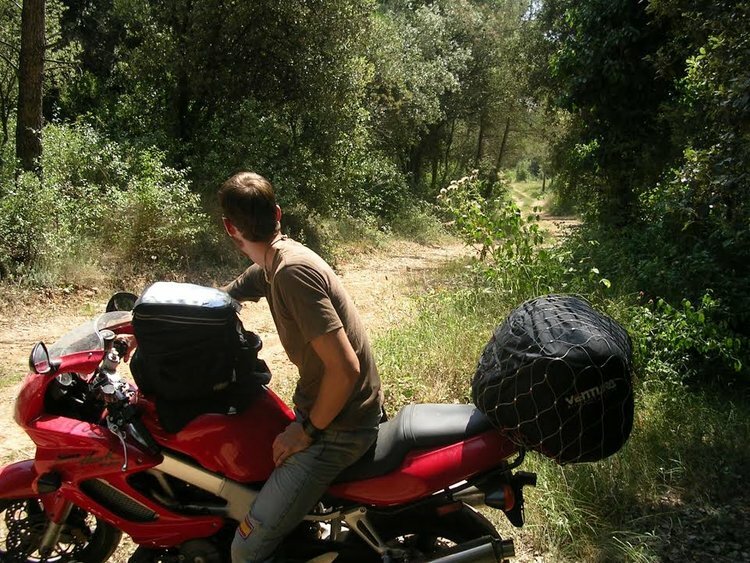 Traveling alone and by motorcycle generates great swaths of silence. In that silence, I found clarity of thought, and plenty of time to explore inward as the world whipped by. Traveling alone left every decision to me, in time building my willingness to choose and my ability to adapt. Almost immediately, I stumbled into the way I still prefer to travel, free of lists populated by “must see's” and icons. There is something powerful in experience without expectations, getting lost, and staying put in one place for a stretch. I wouldn’t say I like traveling without money, but I found I can do it. The struggle has taught me things about the places I’ve been, and about myself that I wouldn’t have seen otherwise. I know I can miss a meal or two and not die, and it’s permanently altered my usage of “need.” I experienced how the locals eat at many of the places I’ve been, and I know what tourists in an incongruously elegant building like look like from outside. I’ve been on both sides of that glass, and I don’t think the chasm between the two experiences serves anyone well. I’ve learned that discomfort doesn’t mean you’ll have a remarkable experience, but I know that avoiding it altogether will surely cost you many. Over those last few weeks, even as it hurt to breathe, to move, to sleep, to hunch over 500 pounds of vibrating steel, I never regretted my choices. Sleeping on broken ribs that miserable night might not have generated an epiphany moment, but maybe it was something better. It was evidence I had accumulated a deep experiential -- almost bodily -- understanding that extraordinary experiences are most often born of risk and the unknown. And when you take risks, sure, sometimes you have to pay up, but in my experience, it’s always been worth the bill. My ongoing transformation, stretched across a million remarkable and mundane moments, has led me to guiding insights and continuously shapes my experience of life. I’ve had many adventures since then, long and short, and each one furthers the lesson, individually and in some subtle collective way. Somewhere, or maybe everywhere, I found my truths. The ones most powerful to me are etched into my chest to stay near my heart. They have served me well, and I have no doubt there are more lessons to uncover. My highest hope for my work in travel is to help other travelers discover theirs.